Would you mind if I translated this into Finnish and published it on Finnish blog platform, with the usual credits and backlinks? Juhani, feel free to do that. 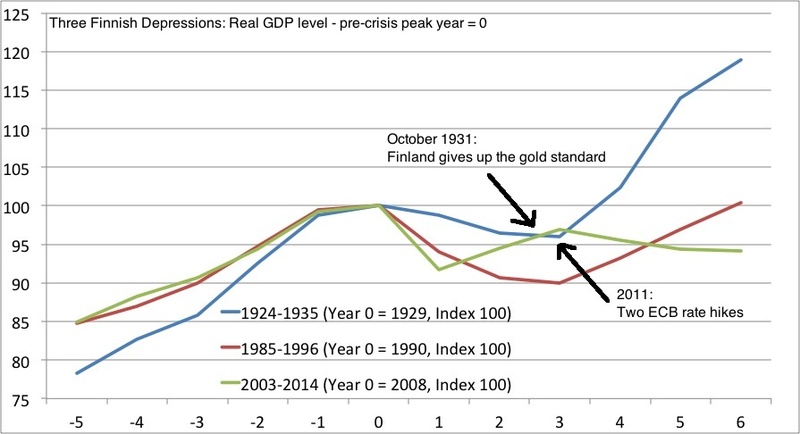 BTW, you fail to mention that the 90’s depression in Finland was largely caused by “strong Finnish markka / internal devaluation”-policy, which was aggravated by linking the markka to the ECU. Note how after an insufficient devaluation in 1991, switching to a regime of free float in 1992 September finally turned the tide. (Protecting the markka exchange rate meant keeping nominal interest rates high during the late eighties/early nineties, and corporations and households turned to foreign currency-loans). The economic policies were so bad, that the politicians had to put the blame for all the troubles on the “tiny, feeble” Finnish markka, and that is the official consensus even today. Yes, I know – the 1990s was also a monetary policy failure. I knew you knew – just wanted to point it out to readers. But maybe I should write a post on exactly that. You won’t be invited to write a economic programme by the Finnish government if you do! The euro is holy and saved us from the high interest rates and the never-ending depression that was caused by the markka. All hail the euro. I found your post incredibly interesting and educating. And please, do write about the 1990s monetary policy failure. 6.all the talk coming out from the “talking heads” focus on something else that te core off the problem, too high taxes, too many working for public sector and too rigid laws, so anything new can be brought in…. and yes, prime minister and president have announced officially on TV that economic situation is on the verge…. What is the policy conclusion for Finland? Based on the analysis, yes, some sort of a devaluation or monetary easing would do the trick. But ECB will follow the average needs of the euro area, not the specific needs of Finland. If the central countries are doing fine, there is no point in changing the policy just to please Finland. And even if the policy changes in the direction that Finland needs, the changes would make all euro countries more competitive, and Finland could still be the least competitive of them. Some people have proposed to leave euro. I think that would help in the same way as leaving the gold standard and floating the markka did. But that is probably out of question to the Finnish politicians, and would remove also the benefits of euro. The third alternative is some sort of internal devaluation. Since that actually means cutting salaries, politicians don’t want to even mention this alternative. This could however be the least painful approach. If the country is generally not competitive (not just temporarily, waiting for the next upswing, but in a more permanent way), this is the most obvious solution. Actually all countries that decide use a common stable currency should be prepared to do also something like this when their economy permanently lags behind the others. Yes, long term structural improvements too, but that’s the long term plan. Finland needs also a short term package to put it back on track. Juho Laatu: the real problem is that the ECB has not been, is currently not and probably won’t follow the average needs of the euro area. Your statement that even if the ECB would ease policy, making life a bit nicer for everyone, it would still leave the relative differences between the countries intact. But that misses the point – if there is a tolerance limit for a country (e.g. too low inflation, NGDP…) that it cannot sustainably fall below, it will not be able to adjust. Greece is a prime example of this. Thus either the common policy “for the average euro area” must overshoot so that even the weakest members can follow, or alternatively the policy must be fragmented (remember LTRO, ELA, dubious collateral requirements from the ECB? Or how bailouts, deficit limits and so on get differential treatment?). The ultimate fragmented (targeted) form of a currency union is not to have a currency union, leaving every country free to pursue monetary or economic targets by any means necessary. The “internal devaluation route” that you vouch for has been done in theory and in practice, and it never worked well. The examples are fresh. In my opinion, the more fragmented is more adaptable and thus preferable. My second choice would be an overshoot. The internal devaluation should be the a choice of last resort. If fragmentation means separate currencies, that would work. But I’m also interested in seeing if we can find means to make a common currency work. Now it clearly is still missing something. I think the original neutral and stable euro was better than the current one with a politically active ECB that makes political (inner circle) decisions on which countries to please and what policy to follow. The overshooting policy could be an option too, but I like a stable currency more. The overshooting policy could mean e.g. continuous inflation that is faster than salary raises in any of the euro countries (minus growth). Sounds old-fashioned. What I’m interested to test is a stable common currency but where each country has its own adjustment screws. Salary cuts could be one. They could be acceptable everyday business too, just like devaluations and floating national currencies once were. Slow gradual cuts would be better than large surprise cuts. I don’t know Ireland’s history very well, but I have understood that salary cuts were a working part of Ireland’s recovery. Many things would be interesting, no doubt. The case against internal devaluation and flexible wages is strong. I think you have misunderstood what “stability” means, or what kind of stability is preferable in an economy. If running a higher inflation in order to avoid nominal wage cuts sounds old-fashioned, I would counter that line by saying that you probably haven’t done your two credit weeks of macroeconomics. Some things are old because they work. Beware postmodernist impulses. I think it is dangerous and not stability-inducing to prefer something just because it sounds modern or would be interesting. We already ran the experiment of a currency union and we saw that wages are not flexible, and the end result was high unemployment rates and deflationary spirals. Just like many times in the past as well. The only way how flexible wages would work IMHO is a basic income system. Actually I think that the economists and politicians have not done their homework. When they said (before euro) that common currency is the way to go, I thought that they had carefully considered and planned what to do when the economy of one of the member states weakens. But obviously not. How on earth do they think that they can continue paying salaries that are higher than the country can afford (in a situation where there is no country specific devaluation). That’s why I don’t trust their opinions on how to solve the crisis either. I think I agree with you on that the euro system has not been well planned. And in my opinion it has gone worse, although the politicians claim that they have now fixed the problems of euro when they changed the rules (no bailout, stable currency etc.). I think they have rather introduced flaws to an (earlier) incompletely understood system. The warnings from the economists were readily available. Mundell’s theory of optimal currency area was well-known. The Finnish EMU-working group warned about asymmetrical shocks and the lack of policy tools within a monetary union. So did the Swedish group. And US economists, and the Brits. It was the politicians who did not pay attention, and, sadly, many economists sensed that it would be a good career move to tell the politicians what they wanted to hear. It happens. So I disagree with your thinking that the economists did not know. They knew, many of them said it but the politics won. In a sense, the euro is populism, while opposing it is not (if populism is defined as a fallacy). I’ve said it for a long, long time: it’s either 1) a well-planned orderly breakup or disorderly breakup 2) full monetary union with fiscal transfers, mutual debt etc or 3) very, very long and deep recession. I guess we are about half-way in the current euro area’s recession (since 2008). Some might say that it is worth going through the rest of the recession in order to get to the wonderful land of plenty. Unfortunately, the euro remains just as borked after this recession as it was before it. There will be another euro crisis, and then another, and at some point the system will not hold. The euro is not a stable state. The full union sounds implausible. Will Germans be ready to finance the rest of the continent? Will other countries put up with the rules that Germany would require? Will voters in every country support it? I guess the most probable path will be a continuation of this recession for a long time, and when things finally get bad enough, some member will try to leave. I’m sure someone has warned about every possible risk in euro. There is always someone who says that he kew it all beforehand. The problem is that political decisions are made by people who obviously do not have any stable understanding of the nature and mechanics of the system that they are supposed to lead. If the politicians do not understand, but some other players with different interests do, the system will probably be different from what we want and what the politicians say it is. Your three alternative scenarios seem quite plausible to me. It seems that you think that the following additional scenario can not work. 4) A stable common currency with no deep union, and with country specific actions to balance the economy of each country in economic up and downturns. I think this would be quite possible too. But I do believe that those in power (political, economical, administrational) are more likely to favour solutions that centralize power and give it to the inner circles.